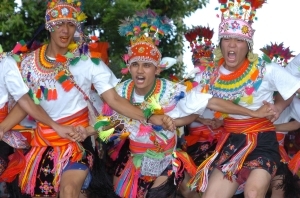 The Amis are the largest ethnic group among Taiwanese aborigines. As of 2004, their population exceeded 160,000. The Amis people call themselves Amis or Pangcah. In their language, Amis means “the North,” and Pangcah means “human being,” “people with the same ethnicity,” or “people of the same descent.” In early documents, the Amis were referred to as Ami or Amis, and other similar names. Various Amis groups use different names to describe the Amis. 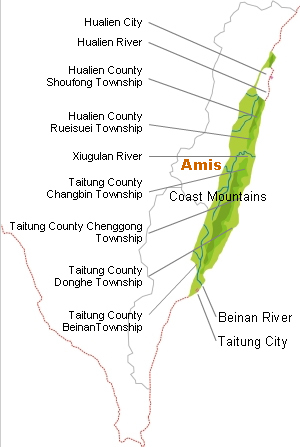 People from the Hualian region call themselves Pangcah and people from the Taitung area are called Amis. Currently, this group is mainly considered to be “Plain Aborigines” and is most commonly referred to as Amis. The number of residents in their communities ranges from several hundred to several thousand. The most significant feature of Amis villages is their proximity to water. The entire group is most often categorized into five sub-groups: the Nanshih Ami, the Hsiukuluan Ami, the Coastal Ami, the Peinan Ami, and the Hengchun Ami. However, in reality, the entire Amis group has integrated members of other ethnic groups, as well, for example, the Sakizaya group, some Kavalan, and some Pingpu migrants from western Taiwan. The Amis' culture is very tolerant and very open to other cultures. Amis communities have been moved many times due to interaction with other ethnic groups and geographical factors. In early times, domestic conflicts or threats from the Bunun, the Atayal or the Puyuma pushed Amis communities to migrate. 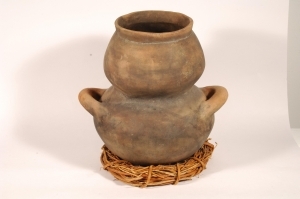 The migration of the Pingpu people from western Taiwan, and the movement of a large number of Han Chinese to the Hualien and Taitung areas are other factors influencing the Amis’ migration. As early as the period of Japanese rule (1895-1945), some Amis people had resettled to urban Taipei and formed the oldest urban aboriginal group. Following the development of the deep sea fishery industry in the 1960’s, many Amis crew members left their hometowns for Kilung, Taipei and Kaoshung. But when deep sea fishery declined, many of these Amis sailors abandoned their fishing nets for concrete molds, moving around different cities to work on construction sites. Nowadays, Amis people are spread throughout large cities. Some of them have built new communities. Migrant issues have affected all of Amis society and culture. The age-set system and matrilineal kinship organization are two main characteristics of Amis communities. Amis communities are mainly centralized villages. In the past, their kinship ties were considered to be matrilineal, but recently, research has called into question the idea that kinship is based on matrilineal lineage, and scholars have instead favored an approach that views the “household” as the center of the social system. The study of the age-set system was more focused on functions and group settings, such as the heritage naming system of the Nanshi Tribe or the creative naming system of the Malan Tribe. Scholars also concentrated on the age-set system as an organization with a political, military or educational function or even an organization serving to provide men with some psychological compensation in a matrilineal society. However, the study of the Amis age-set system has shifted its focus to the inner operating scheme of the age-set organization and on the hierarchical and complementary relations among the age-set organization and other social organizations. Researchers have also emphasized the age-set system as a mechanism between the Amis people and the outside world which stores, operates, and practices the concepts of time and memory. The age-set organization was indeed an important political organization for the operation of traditional Amis communities. In this organization, the elders are endowed with political powers by the tribe. It can be said that the Amis is an elder respecting society. When boys reach the age of twelve, they are enrolled in the preparation group in the age-set organization. After 3-8 years, once they have passed the rite of passage, they become formal members in the age-set organization. Each age set also receives a name. Nowadays, the annual Harvest Festival is the only occasion for people to observe how rigorous the age-set organization is. Outside this event, members in the same group are good friends who support and help each other at any time, even though the organization is not active in daily life. The age sets have three basic naming systems, including heritage names, creative names and a mixture of these two names. Due to their wide geographical dispersion, the Amis tribes are extremely diverse, but all of them have implemented the age-set system, which is a shared feature of their culture. the production method of the Amis was slash and burn millet cultivation, together with fishing. But many tribes had adapted paddy rice agriculture as early as the Qing dynasty (19th century) or later under Japanese rule (1895-1945). Even though there was no strictly gender-based division of labor in agricultural activities, two broad sets of relations can be observed. The first one could be termed “millet-female-household,” and the second, “fishing and hunting-male-politics.” These corresponding relations represent complementary and hierarchical structure among social organizations. 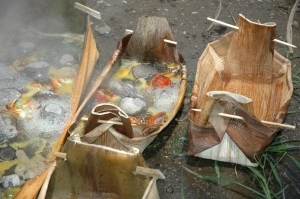 According to Lifok, the Amis’ spiritual beliefs are centered on the concept of Kawas, which is also crucial to their folk religion and the foundation for the explanation of natural phenomena. But in modern times, they have converted to Christianity and Catholicism. Amis people have accepted foreign, dominant religions but their conversion is not as simple as it may seem. They have combined folk religion with foreign religions in both teachings and practices. 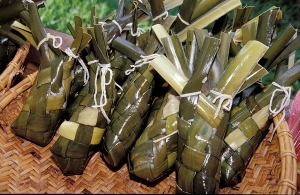 Amis’ traditional priests are called cikawasay. In the southern Taitung region, most of these priests are known as “male bamboo divinators,” but in the northern Hualien region they are females who perform rituals similar to the Taoism of the Han Chinese. Previously, rituals and rites in Amis customs were mostly related to rituals of the life cycle, seasonal agricultural rituals, or rituals performed to escape evil and misfortune. All of the rituals and rites have undergone modifications along with developments in Taiwanese society at large. Today, the Harvest Festival is the best known of all of the rituals. However, names for the Harvest Festival differ from tribe to tribe, and its content or activities vary accordingly. But all in all, the Harvest Festival has become an important emblem for the cultural identity of the modern Amis. Before Han Chinese entered into the Amis’ territory, their main neighbors were the Puyuma, the Bunun, the Atayal and the Truku. Some in the Hualien region claim that they belonged to another ethnic group, the “Sakizaya,” but the Kiray incident under the Qing dynasty forced them to leave their homes, spread into Amis communities and become a part of the Amis. Niyarod means “tribe” in the Amis language, and refers to people who live within fences. It can be surmised that the Amis have a very clear concept of community. This concept also forms the foundation for each tribe to develop rigorous social systems such as the age-set system and closely tied kinship relations. Economic transformations have pressured many Amis to work in urban areas and form urban tribes. These urban tribes have copied the social structure and organizations of their home tribes, so they also set up Youth Clubs with group leaders that are similar to age-sets. Many households in urban tribes have kinship ties or are from the same towns. These Amis migrants hold their urban Harvest Festivals from September to December after they have participated in the hometown Harvest Festivals. 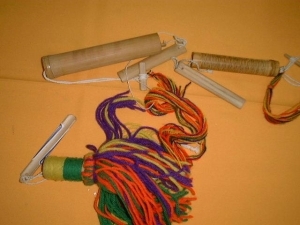 In addition to traditional polyphonic music, outstanding art forms of the Amis are slab woodcarving, uniquely formed pottery that combines ritual and practical functions, delicate glittering traditional cloth, and various forms of cross-stitch embroidery. One common feature shared by Amis traditional art is its close relation with daily life. All works of art are articles for daily use, too. destinations for Amis cultural tourism, as they boast both natural and historical resources. 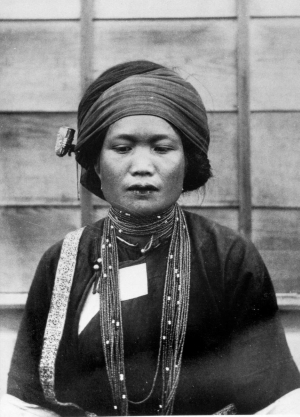 Like other Taiwanese aborigines, the Amis had a political system that was small in scale but independent. Now it has been integrated into the larger national political system. There were many conflicts and protests between the Amis and ruling parties in the past, for example, the Karewan, the Dagunkou, the Chigiauchuang and the Chengkuangao incidents. All of these resulted in heavy casualties and migration of Amis tribes. 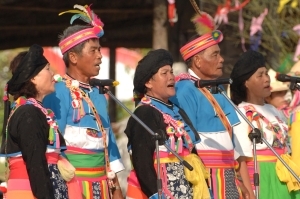 From the entry of Han immigrants up until the KMT government was established, Taiwanese aborigines, including the Amis, had long suffered from “the stigma of identity.” Aboriginal political and social movements led by many aboriginal intellectuals took off in 1983 and have lasted for many years since then. Icyang Parod, an Amis, was a leading figure among these intellectuals. In addition to these booming political and social movements, many Amis artists have become active and are eager to express themselves after being suppressed for so long. Artistic energy generated by Amis artists, together with the spread of social and political movements, has brought significant effects, especially with regard to the resurgence of cultural identity. More and more Amis people have decided to replace their Chinese names with Amis names in recent years. 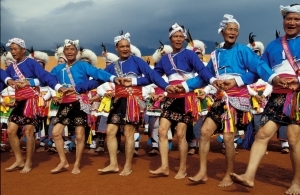 They have also increased their devotion to their traditional material culture and dance performance, established Amis language certification, restored the age-set system, revived the Harvest Festivals, etc.